We use the safest and most up-to-date anaesthetic agents and equipment, you can be confident that your pet is in good hands before, during and after any procedure. Take your dog for a walk before bringing them into the surgery, giving them an opportunity to relieve themselves. Your pet will be admitted by a vet who will carry out a general health check. The vet will go through the consent form with you and answer any questions you may have about the procedure and costs. It is the job of the liver and kidneys to break down the anaesthetic drugs and remove them from the body. Therefore, it is important to check these organs are working before going ahead with the GA, especially in animals over 7 years old. You may want to consider a pre-anaesthetic blood test to give you peace of mind, this will ensure your pet is as safe as possible during the anaesthetic. We may give your pet a pre-med injection, this will help them to relax. 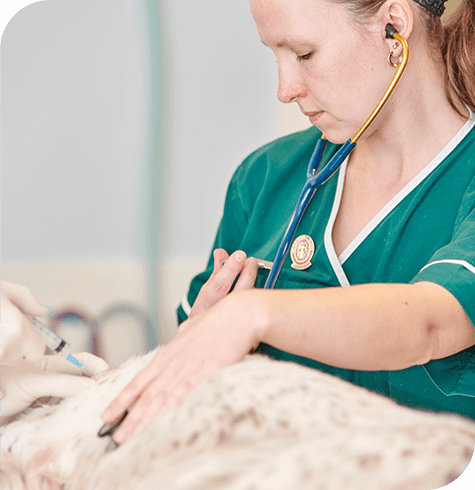 During the operation, a veterinary nurse will monitor your pet’s anaesthetic. After, your pet will recover in our kennels/cattery whilst being supervised and cared for by our nursing staff. Most pets can go home after 4.30pm on the same day. A nurse will discharge your pet and go through any after-care instructions with you. If your pet does have to stay overnight, you can be confident that they will receive on-site nursing care throughout.